Vice President, His Honour Mokgweetsi Masisi as the leader of the delegation. 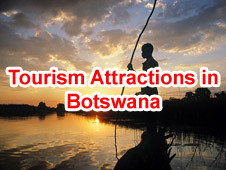 His Honour Mr. Mokgweetsi Masis, The Vice President of the Republic of Botswana, led the Botswana Delegation to the 3rd India Africa Forum Summit held on the 29th October 2015. The Summit was preceded by officials meeting and Ministers for Foreign Affairs meeting on 26th and 27th October 2015 respectively. The delegation comprised of the Minister of Presidential Affairs & Public Administration, Hon. Eric Molale; Botswana's Ambassador to India, High Commissioner Lesego Motsumi; Botswana’s Ambassador to Ethiopia, Ambassador Molefe , and Senior Government Officials. The Summit enabled consultations at the highest political level between the Heads of State & Government of 54 nations across Africa and the Indian Government providing an opportunity for development partnership between the two sides. 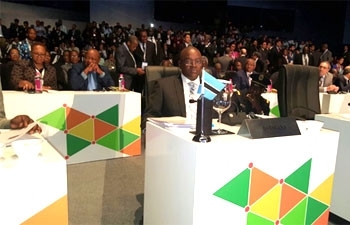 To add value to the 3rd India-Africa Forum Summit, the Prime Minister of India announced an offer of US$10 billion in concessional credit to Africa over the next 5 years in addition to the current on-going credit programme. His government will also offer a grant assistance of US$600 million and this will Include India-Africa Development Fund of US$100 million and India Africa Health Fund of US$10 million. The India Africa Development Fund will also include 50,000 in scholarships over the next 5 years and it will support the expansion of Pan-Africa E-Network and institutions of training across Africa.